All customers who come to the store, whether you are shopping or not, wish you good luck. The charcoal Fabric Top & White Faux Leather Base are lovely touch providing a luxury, soft sitting and sleeping space for anyone to appreciate. A contemporary sofa bed is sumptuously padded. It looks elegant and will fit in any room of a modern decor. 3 Seater Width 205 CM. 3 Seater Depth 90 CM -. 3 Seater Height 100 CM. 5 IN 1 SOFA BED-SOFA. Convertible to bed-120cm wide x 205 cm long. COLOUR CAN BEDIFFER FROM PICTURE DUE TO LIGHTING CONDITIONS. Open Bed Width 185 CM. All customers who come to the store, whether you are shopping or not, wish you good luck. * SALE PRICE £135.21 Regular price £159.99 *Product Features: . Add style and comfort to your living room with modern and functional corner sofa bed RETRO. L- SHAPE SOFA BED WITH STORAGE. easy transform into a comfortable bed. retro style. Scotland, Devon or Cornwall are excluded. GREY CORNER SOFA BED "SOFIA" WITH STORAGE . QUALITY FABRIC. CORNER SOFA BED WITH STORAGE. Add style and comfort to your living room with modern and functional corner sofa bed. easy to transform into a comfortable bed. Depth 140 cm / 55". ·materials of the seat. 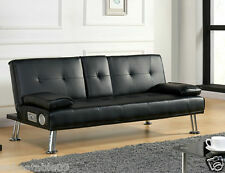 Modern style, 3 seater sofa bed.with two free cushions. you can easy convert it into a bed. Available in a selection of fashionable colours: black red. QUALITY FAUX LEATHER-FREE NEXT WORKING DAY DELIVERY! Double Decker Parasol Garden Sun Shade Umbrella Canopy Wooden Pole 8 Sturdy Ribs. The ottoman storage unit when put alongside the sofa as a converted bed also extends the length giving even more sleeping space. Outdoor 8 Seater Rattan Sofa Set Garden Furniture Set Swimming Pool Lounge Couch. Multifunctional Sofa Faux leather storage box ottoman Sofa bed 2 Cup holders & recliners. Bistro Outdoor Patio Furniture Garden Bench Table Chair Kit Weather-resistant UK. 3 Seater Width 205 CM. 3 Seater Depth 90 CM -. 3 Seater Height 100 CM. Convertible to bed-120cm wide x 205 cm long. COLOUR CAN BE DIFFER FROM PICTURE DUE TO LIGHTING CONDITIONS. Open Bed Width 185 CM. Wysokiej jakości tapczan, wykonany z pianki poliuretanowejT30. Zastosowano w nimsprężyny bonellowe cechujące się dużą wytrzymałością. W tapczanie wykorzystanodrewnianą ramę, zapewniającą stabilność oraz długie lata użytkowania. Total depth in bed position: 223cm.